6.27 points at 11 votes (rank 578). 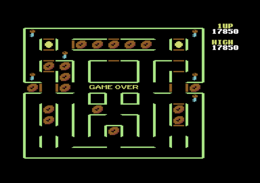 The game "Super Pac-Man" must be played differently than the usual Pac-Man. 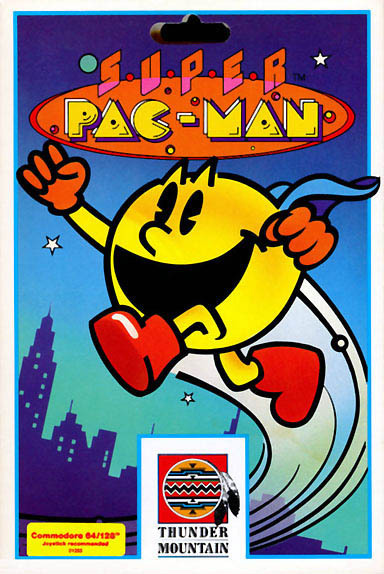 Pac-man has also to watch out for the 4 ghosts in the labyrinth, but only if he hasn't eaten the green or the yellow energy pills and is on the way with his normal size. The yellow energy pills make it possible to eat the ghosts and with the green ones Pac-Man mutates to Super Pac-Man, where he is immune against ghosts and can open doors without having the key. Additionally, you can walk faster by pressing the fire button. When eating a green energy pill, the special bonus in shape of a one-armed bandit is started, which can be picked up by eating the flashing star. If the same symbol is shown on both sides of the star when the star symbol is eaten, there are extra points. To get to the energy pills and dots in the shape of fruits, vegetables or leaves, etc. he needs keys for the doors when in normal size. Key and corresponding door do not need to be next to each other. When everything is eaten up, the round is over. A new labyrinth with faster ghosts and energy pills lasting a shorter time await the player. 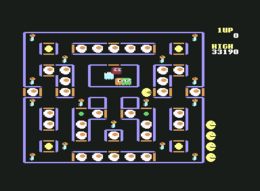 Every three levels there is a bonus level in which Pac-Man has to eat as much as possible within a certain time. 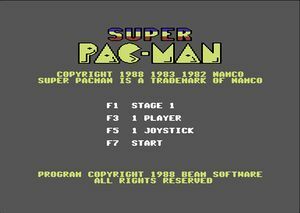 "Super Pac-Man" starts with 5 lives. By the nicely desgined eating dots, the idea of a hyper-Pac-Man, with this a graphically differently designed labyrinth and the new abilities of Pac-Man, this is an interesting game idea. As background sound you can hear a modified wail sound. FX top off the wailing. For each eaten ghost after collecting the yellow energy pill you get 200, 400, 800, max. 1600 points. Every 10.000 points there is an extra life. Yellow energy pills do not only make the ghosts vulnerable, but they also have an effect on how long the state of Super Pac-Man endures (very important in later levels). The version by "Remember" offers next to different trainers (unlimited lives, invincible, no keys necessary for doors, jump level) also the manual. Werner: "I couldn't really cotton up to this Pac-Man version. 5 points." 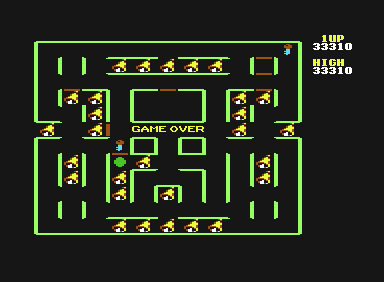 Robotron2084: "Confusing, complicated (at least for a Pac-Man game) and frustrating. You can forget chasing ghosts here. A very strange game. And also from 1988... umm, well, 5 out of 10 points." H.T.W: "This thing was a hit on the arcade machine and I also like the conversion very much. Starting from level 3 it gets dandy difficult or maybe these are my fading reflexes...". Super Pac-Man in the Killer List Of Videogames.